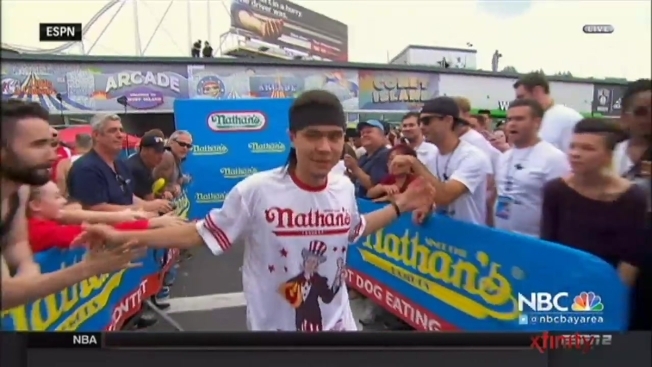 Matt Stonie shocked the competitive eating world on Saturday by upsetting Joey "Jaws" Chestnut at the Fourth of July hot dog eating contest at Nathan's Famous in Coney Island, breaking Chestnut's bid for a ninth straight victory. Stonie, 23, who finished second last year, downed 62 hot dogs and buns, beating Chestnut by two. Both are from San Jose, California. As thousands of spectators observed the eaters on an elevated stage, the next closest competitor ate 32 hot dogs. "I trained hard for this. This is actually amazing," Stonie told ESPN, which broadcast the competition live like the major sporting event its biggest fans say it has become. Afterward, Stonie, holding his fist in the air in victory, said he came into the competition confident and prepared. Chestnut, smiling in defeat, said he was slow and couldn't catch Stonie. "I've been looking for competition for a long time and I finally have it," he said, vowing to return next year. "He made me hungry." Early in the contest, Chestnut seemed to have a slight edge but Stonie moved ahead after several minutes and seemed to be slowly extending his lead until the final bell. The men's contest came more than an hour after the women competed, with defending champion Miki Sudo capturing first place with a flourish that emphasized strategy rather than condiments. The Las Vegas woman ate 38 hot dogs and buns in 10 minutes to claim the title for the second straight year, along with the $10,000 that comes with it. She retained the coveted mustard yellow winner's championship belt after downing four more wieners than last year and besting Sonya "Black Widow" Thomas of Alexandria, Virginia, who devoured 31 hot dogs. Sudo employed a successful strategy of eating the hot dogs separately from the buns and swallowing the buns after first dipping them in Crystal Light. A very light rain fell off and on before the event got underway. The colorful holiday tradition draws its share of characters. Someone walked around dressed as a giant hot dog. The spectacle also included a few chanting animal welfare protesters bearing anti-meat signs adorned with fake blood. Security included police dogs that apparently were not thrown off by the scent of the grilled meat, along with police officers on rooftops.